There was a girl named Lina she, and her friend Doon lived in the City of Ember. They found a Note that look very inportant they called it the instruccions. They whent in to the piperworks, and found a room full of supplies. Then they found a way out of Ember, and discover they were underground. Then the rest of the cinzents of Ember got out too. Then they found a villege, and decided to stay, and recover there. I loved this book, but it was a little bit boring at first because there was a lot of pages that were explaining the City of Ember. But if you got more into it it started to get very exting, and mysterious. It is a very good book because it was intresting, and intriguing. I really recomend this book. This was more of a YA book, but still enjoyable. The beginning was kind of slow to develop and it wasn't until about halfway through the book that the action started to really get underway. I really enjoyed the ending. A little predictable, but the proper end for the story, and left room for sequels. 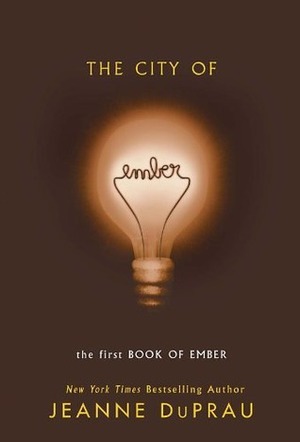 Book Description The city of Ember was built as a last refuge for the human race. Two hundred years later, the great lamps that light the city are beginning to flicker. When Lina finds part of an ancient message, she's sure it holds a secret that will save the city. She and her friend Doon must decipher the message before the lights go out on Ember forever! This stunning debut novel offers refreshingly clear writing and fascinating, original characters. A new favorite -- exciting and engaging from beginning to end! I liked what I read -- several years ago..